Whether you want to add a lot of shine or just a little, JustforJeeps.com has chrome accessories for your Jeep Wrangler that you can buy individually to personalize the looks of your ride. 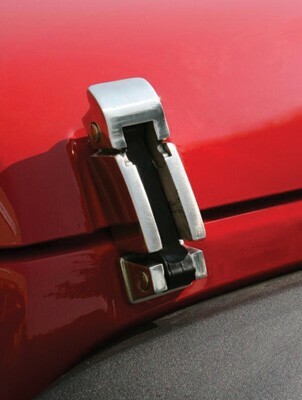 These chrome-plated hood latches (part number 111606RR) add a little glow to the front of your Wrangler. They are made of sturdy stainless steel and are sold in pairs. The hood latches are pre-assembled with an integrated molded rubber tension strap so you can bolt them in place of the plastic latches in a matter of minutes.